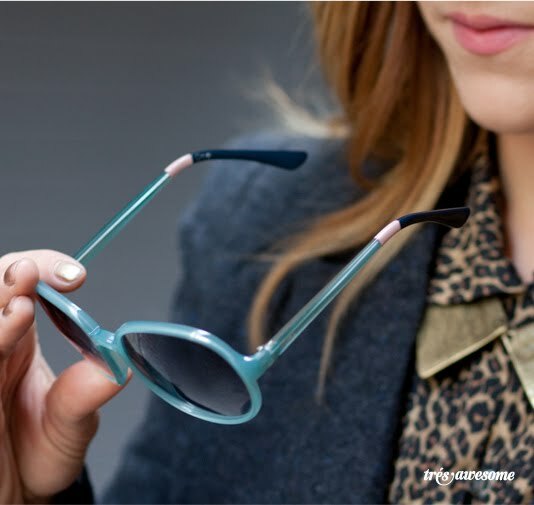 On the heels of it's very successful 1-for-1 shoe campaign (pun very much intended) TOMS has launched an eyewear line with the same premise. For every pair of sunglasses purchased TOMS provides a pair of prescription glasses or sight saving eye surgery to someone in need. Our lovely intern Jackie looks super cool in these Classic light blue frames. I'm also loving her faux metal collar and leapord print shirt. Altogether a great outfit. The color blocking on these frames is a nice and unexpected detail. Watch this moving video to learn exactly how the One for One program works. These are sweet and for a great cause! Glad to learn about them. Thanks! Love the double collar! Great outfit, Jackie! And thanks Très Awesome for the TOMS eyewear plug. It's a truly incredible program. These are SUPER cool I totally want a pair. Thanks for posting. I finally got a pair at the giant Belmont Army store in Lakeview. Still on the hunt for that collar though, I tried to make one but just can't get it right.